One of the most cost effective investments you can make when building or renovating on the Sunshine Coast is choosing the best windows and doors to keep your home comfortable, secure and quiet all year round. With extensive knowledge of the Sunshine Coast and surrounding areas, we can help you make the right choices to satisfy energy, acoustics, security and bushfire requirements. The Smart Solutions range is designed to augment all Essential, Signature and Commercial products to satisfy these needs. Compared to other building materials, ordinary windows and doors are poor heat insulators. They are the point of least resistance for heat flow, allowing a significant amount of heat loss and gain compared to other building materials. A typical, well insulated house with ordinary windows and doors can lose up to 49% of its interior heat in winter and allow up to 78% of solar heat gain in summer. Energy efficient windows and doors are designed to provide higher levels of resistance to heat transfer – acting as extra thermal insulation through high performance frames, seals and glass. They help insulate from temperature extremes, smoothing out the peaks and troughs throughout the year – helping homes stay cooler in summer and warmer in winter. Solar Block™ is the simplest and most cost-effective way to reduce the heat and glare of the Australian sun, like a pair of sunglasses for your home. It’s attractive grey tint helps stop temperature from soaring in the heat of the day, reducing the need for air conditioning and keeping your home cool and comfortable, all year round. Up to 36% reduction in heat gain. Up to 78% reduction in glare. Solar Comfort™ is a comprehensive window and door energy efficient system designed to reduce the amount of warmth lost during winter and prevents unwanted heat gain during summer. The Solar Comfort ™ system uses low- e (emissivity) glass to reduce radiative heat transfer. 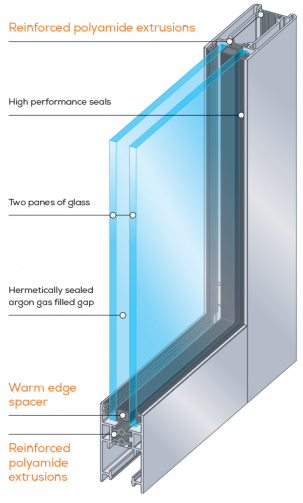 It also includes high quality seals stopping heat from leaking between the low-e glass and aluminium frame. Together they increase the ability of the Solar Comfort system to insulate. This keeps heat inside during winter – and out during summer. Designed for all seasons, Solar Comfort™ is best suited to temperate regions, where heating is needed during the wintertime. Up to 40% heat loss. Up to 50% heat gain. 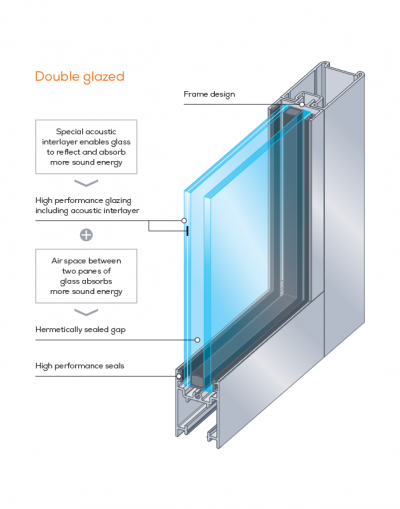 Double Glazed products are designed to reduce the amount of warmth lost during winter and prevent unwanted heat gain during summer – helping homes stay cooler in summer and warmer in winter. They consist of two panes of glass bonded together by a spacer and separated by a hermetically sealed argon gas filled space. The air gap acts as a thermal barrier between the inner and outer pieces of glass, creating an effective insulation system. Suncoast Windows double glazed products feature a warm edge spacer made of an extruded, thermoset polymer structural silicone foam which delivers exceptional thermal performance, argon gas retention and long-term durability. Double Glazed products are available in different glazing options. Suncoast Windows’ double glazed products can also help reduce the incidence of condensation on the glass of windows and doors during winter. The hermetically sealed argon gas filled space and the warm edge spacer act as thermal barriers. They keep the surface of the interior piece of glass similar to the room temperature. This reduces the incidence of moist air inside the house meeting cooler surface of glass, which facilitates condensation. Up to 23% in energy costs. The amount of condensation on glass during winter. 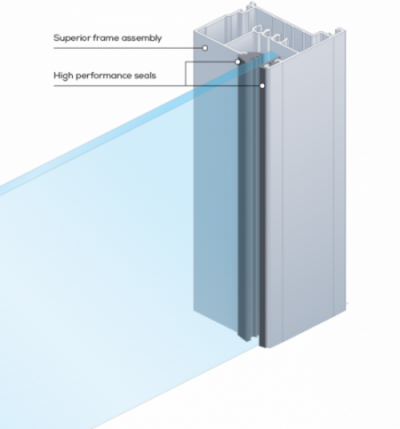 Signature Thermal Break uses advanced technology to create a barrier between the interior and exterior surfaces of windows and doors, improving the energy efficiency of buildings. 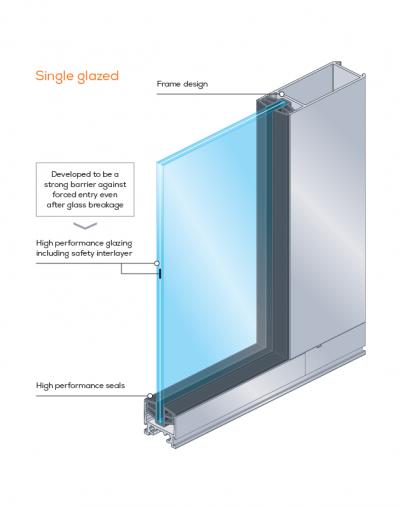 The Thermal Break system uses reinforced polyamide extrusions and double glazing with a warm edge spacer to separate the exterior and interior of the aluminium window or door. Together, they act as insulated barriers, stopping heat from passing from one side of the door or window, to the other. This keeps heat inside during winter – and out during summer. Although they may seem the culprit, windows and doors do not cause condensation. 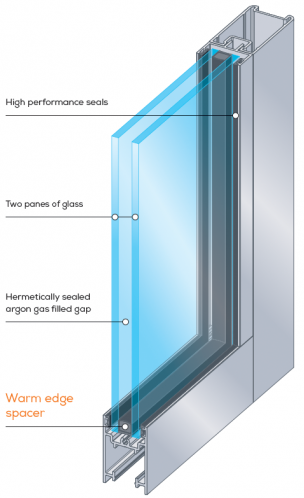 In fact, the Signature Thermal Break range is designed to help reduce the incidence of condensation on windows and doors. 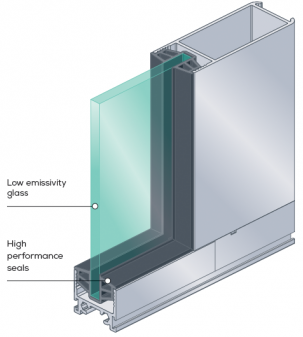 The reinforced polyamide extrusions and double glazing unit act as thermal barriers. They keep the interior surfaces of the windows and doors similar to the room temperature. This minimises the incidence of moist air inside the house meeting cooler surfaces, which facilitates condensation. Provide up to 27% reduction in energy costs. Reduce the amount of condensation on frames and glass during winter. Living near a busy road or just want some privacy? Ordinary windows and doors do little to reduce noise. To reduce neighbourhood, traffic and other external noise from entering your home, consider using Sound Smart™ products. Frame design, seal type and glass type all play a part in reducing noise transmission. The frames of Sound Smart™ windows and doors have been designed to accommodate different type of acoustic seals and glazing options. If a window or door is not well sealed, noise will find a way to get through. Sound Smart™ products use superior acoustic seals in order to block air gaps and reduce vibration of the glass and frame, ensuring that noise is kept on the outside. High performance glass blocks sound both by reflecting noise back towards the source, and absorbing sound energy within the glass. The amount of noise reflected and absorbed can vary depending on the type of high performance glass. To meet demand for added protection for houses, townhouses and apartments, Suncoast Windows’s platform window and door offer can be augmented to provide a higher level of safety than ordinary windows and doors. Most solutions involving increased levels of safety mean compromising on the design and aesthetic of windows and doors – not with Suncoast Windows’s Safety Smart Solutions. The products provide a high level of design flexibility. Windows and doors are available in expansive sizes and lifestyle configurations, with modern hardware and beautiful frame colours. Customers can have added protection without compromising the look that they want. Suncoast Windows’s Safety Smart Solutions offer much more than strong protection from forced entry. They also provide protection from harmful ultra violet light (UV). The safety interlayer within the high performance glazing can screen out a large percentage of UV light from passing through the glass – reducing the fading of furniture, curtains and carpet. In recent years, Australia has experienced some of the most extreme summer conditions on record – – and a rise in the risk of bushfire. Building standards require every new home built in bushfire-prone areas to use bushfire rated building materials for construction. To help meet these requirements, Suncoast Windows offers a range of bushfire rated window and door products….Flameshield. FlameShield™ is fully compliant with all Australian Bushfire Attack Level (BAL) Standards.